Sculptor Hugh Townley didn’t get his due, at least not in his lifetime. That is not to say, however, that he wasn’t a successful artist. 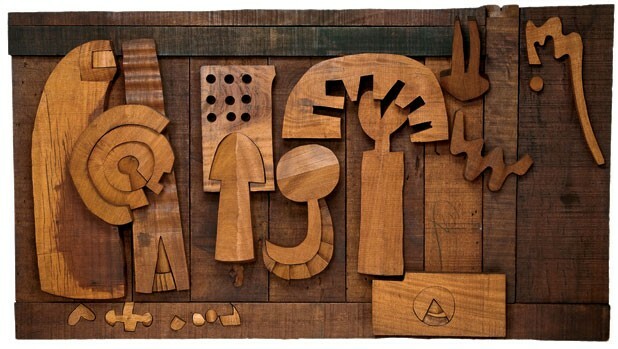 Townley’s abstract wooden sculptures reside in some of the nation’s most important museum collections, including those of the Art Institute of Chicago, the Museum of Modern Art and the Whitney Museum of American Art in New York City. He was a professor of art at Brown University for 30 years, and over the course of his sculpting career he produced more than 1000 works. Perhaps the most significant indicator of Townley’s success, though, is also the most intangible: He constantly sought out new methods and ways of seeing his own work, experimenting with materials, sculptural forms and even colors right up until he died last year at the age of 85 at his home in Bethel, Vermont. Anni Mackay, executor of Townley’s estate, believes he hasn’t received the recognition he deserves and has set out to change that. She has launched three major exhibitions of his work, two just in the last six months: one at Wheaton College last fall and one running currently at the University of Vermont’s Fleming Museum. Mackay earned the octogenarian artist’s trust in 2004 when she opened BigTown Gallery in Rochester, a small rural backwater on Route 100. Now she is schlepping pieces from Townley’s estate — 150 works of art, including drawings, prints and delicate, cumbersome wooden sculptures — from venue to venue. Mackay hopes that Townley’s name will eventually rise from obscurity and take its rightful place among his more famous and influential contemporaries, such as William de Kooning, David Smith and Louise Nevelson. If Townley is so important, why is he a relatively unknown quantity? Does his work hold up 40 years later? Is it as fresh and powerful as art critics believed it was in the 1950s and early ’60s, before Townley and many other artists were swept out of the limelight by abstract expressionism? Aimee Marcereau DeGalan, curator of the Fleming exhibition, is attempting to answer those questions in the museum’s show “Hugh Townley: Against the Grain,” which includes pieces on loan from friends, museums and the artist’s personal collection. DeGalan says one reason Townley is one of the most important sculptors you’ve never heard of involves his personality. Perhaps his Midwestern upbringing gave him an extra dose of stubbornness and an overweening sense of integrity and modesty. (Townley grew up in Lafayette, Ind., and majored in fine arts and anthropology at the University of Wisconsin.) Certainly his early training in Paris with the Russian émigré sculptor Ossip Zadkine, who is known for his Cubist-style sculpture, helped Townley solidify his aesthetic approach, from which he never wavered. Whatever the reason, Townley didn’t stoop to playing the popularity game: He wasn’t willing to change his artistic vision to match the fashion of the day, nor was he interested in marketing his work. Early in his career he had major group exhibitions at MoMA and the Whitney, but apparently didn’t use this high-profile exposure to his advantage. Townley had, for example, no gallery representation. There is no question, however, about the quality of Townley’s work. The Fleming’s promotional materials tout him as “one of the most original wood sculptors of the 20th century.” DeGalan says no one else was working with wood (mahogany, obiche, oak, plywood) the way Townley did, using natural grains, imperfections and colors as a kind of three-dimensional palette. “Townley thought about tonal ranges in the way painters use a brush to create color tonality,” DeGalan adds. The Fleming exhibition features a cross-section of Townley’s work, from his first ceramic prototypes to his free-standing, totemic wood sculptures, and the intricate plywood sculptural reliefs he created in the last 11 years of his life in Bethel. The show also includes drawings and prints. Though Townley’s sculptures changed over time, the expression of his ideas through a personal set of spiritual symbols did not. He created this narrative language partly as a response to his studies of American Indian religion and Hinduism. The symbols seem to have functioned as a kind of shorthand for his beliefs about the dualities of life and death, good and evil, mind and body. In “Wendigo,” an early work, Townley fashioned a man-sized, three-legged sculpture from large pieces of mahogany. The creature has a star for a heart and a large maw for a head, and a harpoon-like piece swings from a chain between its legs. When DeGalan explains that “Wendigo” is a Native American term for a cannibal spirit, the terrifying energy of the sculpture begins to make sense: Fear has a name. The exhibition includes several of these early totemic, three-dimensional works, and they exude a raw dynamism and power, in large part because of Townley’s carving mastery. He was equally adept at machine and hand sculpture, and often used both methods in tandem. While his work is primitive in style, there is nothing unsophisticated about his techniques, or his ideas. Townley’s sculptures appear simple, but they are often composed of many small pieces that fit perfectly together, physically and aesthetically. This artistic vision carries over to Townley’s relief sculptures; this seems to have been his preferred medium through his middle years. Sometimes the works are confined in a rectangular shape, but just as often they are freeform wall sculptures. A prime example is Townley’s homage to abstract-expressionist painter de Kooning, titled “deK is Dead.” Here, objects with no sensible relation to one another — a curtain, a paintbrush, a table and other forms — create an abstract tableau. The curtain, made up of a series of arcs, bears down on the paintbrush, which appears loaded with paint because of the way Townley has used the mahogany grain. The table, on the right side of the relief sculpture, consists of one vertical and one horizontal line that happen to come together at a point. This simple, instantly recognizable form works as a counterpoint to the tension generated by the movement in the rest of the piece. It’s as if Townley is saying that ordinary life will carry on even when deK’s paintbrush is covered by the final curtain. Townley’s later works are all reliefs; he developed Parkinson’s at the end of his life and could no longer lift the heavier pieces of wood (though he still used a bandsaw and other machine tools). He also began playing with painted reliefs that look like children’s jigsaw puzzles (à la Roald Dahl, perhaps) and elaborate plywood relief sculptures. Though only time will tell whether Townley’s sculptural legacy can hold up against his contemporaries and bring this stylistic outlier into the art history canon, it’s obvious that he stands on his own quite well. And when he’s borne on the shoulders of friends who are determined to expand his audience and help viewers understand his place in 20th-century art, Townley has a good chance of reaching the heights. “Hugh Townley: Against the Grain,” Fleming Museum, University of Vermont, Burlington. Through March 22. On March 4, at 12:15 p.m., the Fleming Museum hosts a lunchtime talk about Hugh Townley’s work with cartoonist Ed Koren; Eugenia Robbins, director of Friends of the Vermont Statehouse; and Aimee Marcereau DeGalan, Fleming curator. Free and open to the public; lunch available for purchase in the museum lobby.